Has the Witness been stopped? Is the 12 Monkeys TV show cancelled or renewed for a fifth season on Syfy? 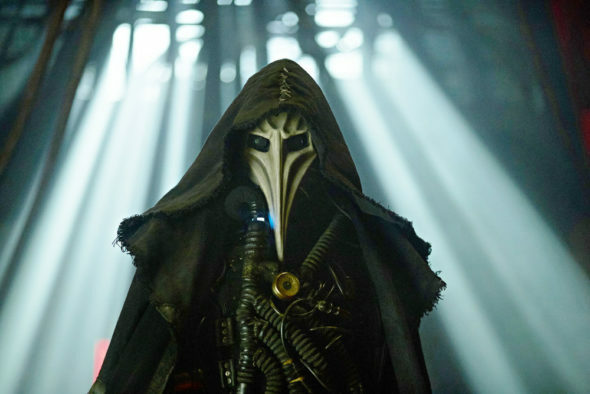 The television vulture is watching all the latest cancellation and renewal news, so this page is the place to track the status of 12 Monkeys, season five. Bookmark it, or subscribe for the latest updates. Remember, the television vulture is watching your shows. Are you? The fourth season of 12 Monkeys averaged a 0.06 rating in the 18-49 demographic and 290,000 viewers. Compared to season three, that’s down by 35% and 16%, respectively. Find out how 12 Monkeys stacks up against the other Syfy TV shows. In March of 2017, Syfy renewed 12 Monkeys for a fourth and final season. The series ended on July 6, 2018. Could it come back one day? Stay tuned for further updates. Since the show is ending with this fourth season, there is no need to wonder whether Syfy will cancel or renew 12 Monkeys for season five. I’ll still keep an eye on the Nielsens, because it helps with predictions for other Syfy TV series. I’ll watch the trades and press releases too, and pass along any word about potential spin-offs or revivals. Subscribe for free 12 Monkeys news alerts. TV show ratings are still important. Follow 12 Monkeys‘s weekly ups and downs. Find more 12 Monkeys TV series news or other Syfy TV show news. What do you think? Is the 12 Monkeys TV show ending at the right time? If it were up to you, would Syfy cancel or renew this TV series for season five? More about: 12 Monkeys, 12 Monkeys: canceled or renewed?, 12 Monkeys: ratings, Syfy TV shows: canceled or renewed?